Powers/Abilities: Like all Wendigos, this one is covered with white fur, and possesses clawed hands and feet, a long tail, and fang-like teeth. He possesses the same superhman abilities as other Wendigos, including Superhuman Class 75 strength, as well as enhanced speed, stamina and endurance. Height: (as Fleet) unknown; (as Wendigo) 9'7" Weight: (as Fleet) unknown; (as Wendigo) 1800 lbs. History: (Marvel Fanfare II#3 (fb)) - Michael Fleet was part of a cryptozoological expedition in the Great White North region of Canada, searching out the legend of the Wendigo. The group was caught up in a terrible blizzard. With the rest of his team dead from being buried under the ice, Michael had no choice but to feed off their bodies to remain alive. This invoked the curse of the Wendigo, transforming Michael into the creature. 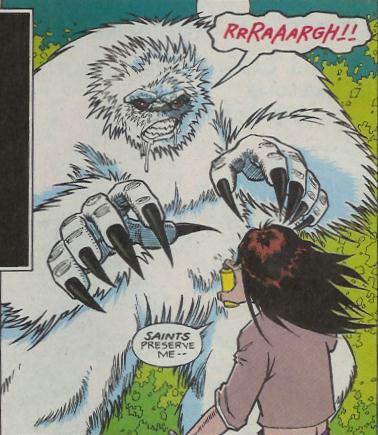 (Marvel Fanfare II#2 (fb)-BTS) - Michael's brother Jonas, another cryptozoologist, sent another team some time later to find the creature, under the guise that they were searching for the legendary sasquatch. This group was massacred by the Wendigo. (Marvel Fanfaire II#2) - Jonas, his wife Tamara (who had once been engaged to Michael), and Heather Hudson (Vindicator of Alpha Flight) arrived with local authorities to clean up the crime scene. Wolverine, who had been in the area, dropped in to see what was going on, and realized from stool left behind that this wasn't a sasquatch, but a wendigo. As he left to track the creature, Jonas followed. The two arrived near a cave just as the Hulk, seeking isolation, landed nearby. This caused the Wendigo to emerge and attack the green behemoth. 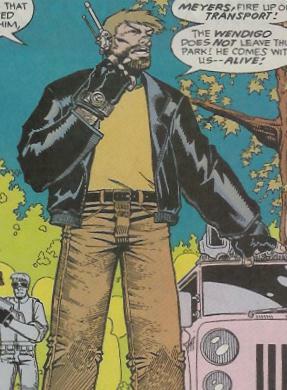 Wolverine joined in the fight, and Jonas used technology borrowed from SHIELD to capture the Wendigo. As he, Tamara (whom he still had not told his suspicions that the Wendigo was her ex-fianc�), and a drugged Wendigo flew over New York City, Tamara attempted to kill the beast she believed murdered her former lover. However, the beast managed to growl out her name, startling her. The Wendigo then broke free of his restraints and the ship itself, falling into New York. (Marvel Fanfare II#3 (fb)-BTS) - The Wendigo made its way south in the city, from Brooklyn to Central Park. (Marvel Fanfare II#3) - The Wendigo confronted a young woman who tried to use mace on it, angering the monster. 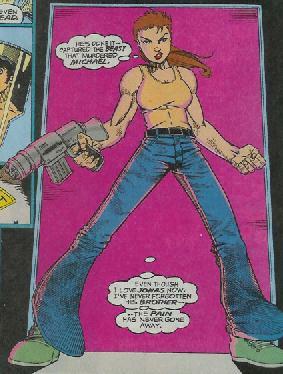 Before it could attack her, she was saved by Spider-Man and Ghost Rider, who had arrived searching for the local killer. While the three fought, Jonas and Tamara arrived, wounding the creature, sending it fleeing back into the woods. Jonas briefed Spider-Man on the situation, leaving out his knowledge that the Wendigo was his brother. They tracked the monster to the Central Park Zoo, where it had killed several people there as well. The Wendigo grabbed Tamara, almost gently, trying to communicate with her. Ghost Rider arrived to deal his hand of justice to the monster, but Spider-Man, realizing this was not the way, stopped the Spirit of Vengeance. Ghost Rider instead used his penance stare on the creature, and found the truth about the fate of Michael Fleet. The now-docile beast was taken into custody, with Tamara by his side. Comments: Created by Joe Kelly, Pop Mhan, and Mike Witherby. For the most part, many Wendigos only exhibit the ability to speak the name of the curse ("Wen-di-go! "), but Fleet managed to speak Tamara's name while under the curse. This is not all that uncommon when a Wendigo with an unusually strong human presence is in control. 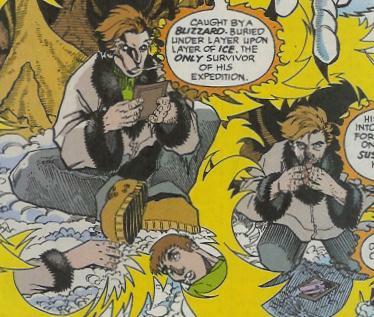 Mauvais was able to speak while under the curse, and Baptiste briefly could shortly after his transformation. The Yeti, a Wendigo who was controlled through Weapon PRIME technology, became fairly articulate. In one divergent reality, Logan was able to keep his own personality and speeking abilities when he was turned into the creature. The powers and physical description of this Wendigo are assumed to be the same as the first four listed below, all of which shared the same statistics in the Marvel Universe Handbooks. Jonas Fleet was a cryptozoologist along with his brother, Michael. After Michael and his team seemingly perished, Jonas realized that Michael was the Wendigo that wiped out a search party looking for the original team. He tagged along with Wolverine to capture the beast, finally doing so in New York thanks to the help of Ghost Rider and Spider-Man. Tamara, who had married Jonas after the loss of Michael, left him, aghast that he hid the knowledge of the Wendigo's true identity from her. Tamara Fleet was originally romantically involved with Michael Fleet, but after his disappearance and apparent death, she found herself attracted to his brother Jonas. The two searched for the Wendigo, whom Tamara believed to be responsible for her former lover's death. After the two had apprehended the creature, it recognized Tamara, calling out to her in its bestial grunts. It then escaped into New York. Once Tamara found out that Jonas had kept his knowledge of the Wendigo actually being Michael from her, she grew cold towards him. When last seen, she was accompanying a captured Wendigo into custody/treatment.